After reviewing AirParrot (AirPlay mirroring from Mac / PC to Apple TV 2 and 3) and Airfoil (Airplaying music and sounds from Mac / PC to AirPlay enabled devices and vice versa) on Windows 8, today I tested AirServer intensively on my Acer Aspire 1810T running on Windows 8 Pro with Windows 8 Media Center. It seems that AirPlaying videos and mirroring iPhone’s or iPad’s screen on Windows 8 is a hard job for apps like AirParrot and Airserver. Airserver faces similar stability problems like AirParrot. Both are running unsteadily on Windows 8. “AirServer is a powerful Mac/PC application that enables you to stream or mirror your iOS device, such as your iPhone 4S, to your Mac/PC. What you need is on the one hand a Mac running OS X Tiger / Leopard / Snow Leopard / Lion / Mountain Lion (Intel/PPC) or a PC running Windows 7, 8 or Vista, on the other hand an iPad, iPhone (3GS or later) or iPod touch (second generation or later) running the latest iOS software. Alternatively, you can use an Android device running doubleTwist+AirTwist. Note: Mirroring is only available for iPad 2, iPad Retina, iPad Mini, iPod Touch 5, iPhone 4S and iPhone 5. Further more you need a Wi-Fi connection for activation and a Wi-Fi or ad-hoc network for operation. Mac and PC licenses are sold separately due to separate build and update costs. 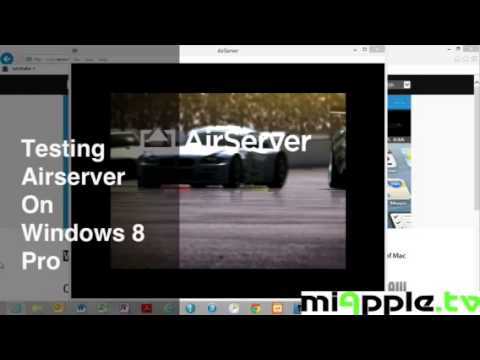 On my YouTube Channel miApple.TV you can watch my video “Testing iOS AirPlay AirServer On Windows 8” conducted with a new iPad Retina 4th generation. Here you can see the instability issues I mentioned in the beginning of my article. At the ending the AirServer app crashes completely. Even an uninstallation followed by an fresh installation didn’t make it better. A test with my iPhone 4S failed, too. Taking everything into account AirServer runs unsteadily on Windows 8 Pro. The app must be improved for Windows 8 in a similar way AirParrot has to be optimized. Up to now I personally cannot recommend AirServer for application on Windows 8. Have exactly the same problem, tried Airserver for weeks on my W7 HTPC, had a few suggestions from their support like reinstalling Itunes, bonjour, firewall, routersettings etc. Nothing works, connects but crashes after a short while. All is fully updated, Airserver 1.1.8. My W8 system is somewhat more stable, but choppy (wifi connected). Have not found anyone but you with problems on any forums, is Airserver for windows really working for everybody else? Nope, its garbage for me too on Windows 7. Audio constantly skipping. thanks for your feedback. Have you installed the latest Airserver update 1.9.6 for Windows?